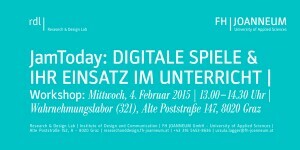 Wednesday 4th of February 2015 from 1 – 2.30 p.m.
What is the use of digital games in tuition? How can they be reasonably applied to achieve the ideal educational objective and which varieties do already exist? JamToday supports the creation, implementation and deployment of educational games by creating methods and tools and by providing a central learning hub for participating organisations that will ensure that stakeholders maintain a balanced understanding of the main issues, and the implementation hurdles that need to be overcome. JamToday also provides game jam tools, self-assessment modules, expert advice and the exchange of best practice. Through these activities JamToday aims to provide a bridge between different sectors to guarantee the successful uptake of the next generation of educational games across Europe. And we can offer you the necessary structure, guidance, tools and support to get involved. The main emphasis of this workshop is in the field of health and sustainability. After the workshop there is a chance for an informal dialogue and an exchange of ideas for further cooperations etc.